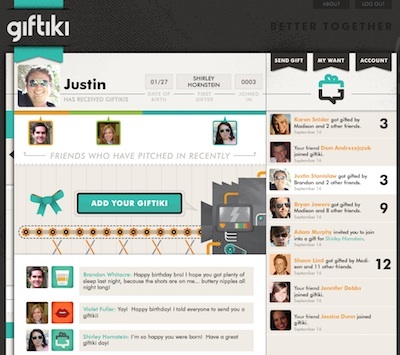 Giftiki, launching today, says it is a “gifting engine and social commerce platform that will alter the act of gift giving as we know it.” It’s all very clever–and also very familiar. independant “gift card that works absolutely everywhere.” Oh, and LetsGiftIt, and a few others, too. What’s going on here? Why are there suddendly all these sites popping out of their ribbon-wrapped packages? For starters, we’re all now plenty used to social networking, to online payments, to playing in collaborative online games, and we’re warming up to group micropayments thanks to sites like Kickstarter. In explaining Shareagift, founder Justine Angelli noted her inspiration came from gift-buying experiences of her own, an awareness of social networking and group microfunding, and the fact “in these rather hard economic times, when people don’t have the money to waste on presents” that it seemed a good conclusion. Giftiki founder and CEO justin Stanislaw tells Fast Company that “The light bulb really went off when I received the following for a birthday: an ugly tie, a shirt that I would never wear, five greeting cards that were empty, and a million text messages and Facebook posts,” when what he really wanted was front and center seats to an NBA game. Aware that “we are trending heavily towards collaborative commerce,” thanks to social networks and the need to “spend smarter,” he created Giftiki. And, of course, there’s the money. Giftiki’s press release notes there’s an “estimated 82 million birthday-related posts” circulating through Facebook every day. To put a number on how big the birthday business is, Hallmark Cards (whose products couldn’t be simpler and cheaper to produce, yet have captured much of the market) had revenues in 2010 of $4.1 billion–a figure that may have played into Apple’s (yes, that Apple!) plans to enter the online greetings card business. Remember then that birthdays pop up regularly, but the holiday season comes once a year, and Comscore estimated that in 2010 U.S. consumers spent $32.6 billion online, up 12% on the year before. It’s this sort of potentially hundreds of billions of dollars spending (usually spent in a very traditional manner, but slowly moving online) that these gifting sites want to get their hands on, and this is the reason–most likely–that AmEx is on-board with Giftiki. It may be testing out how well Serve works in an online gift-buying environment. But there’s likely more than that going on. Groupon’s emergence (along with a host of emulators) and runaway success has shown that consumers really are keen to embrace online spending, as well as new ways of thinking about the entire experience. Sure, Groupon sells discount vouchers, and every consumer is going to be tempted by that sort of deal–but it’s also selling a tiny snippet of shopping joy: The notion that you may be able to regularly spend less on something you would otherwise have paid more for, or that you could try a new place to shop or enjoy a service that you’d not otherwise have attempted, or even a new thing altogether. Kickstarter, meanwhile, is partly about buying cool and highly novel innovations, but it’s also about bringing a tiny, safe, fun, rewarding sample of entrepreneurial investment power to the average, tech-savvy Joe. Unbound is about getting access to authors while they write new books, getting early looks at fresh and exciting new texts–but it’s also about a new way of buying books. The collaborative angle of these services is about interacting as a conscious, self-aware public mass versus the faceless, profiled, Nielsen-ized, PR-labeled, demographically demarcated mass that companies once took us for. In short, what we may be seeing here is the first wave of companies being aware that shopping has changed forever, and not just in a simple, Amazon-ian manner. It’s plausible that Western consumers, at least, are ready to try wholly new modes of shopping. Which means things ilke the hot-tipped NFC revolution really may work out.